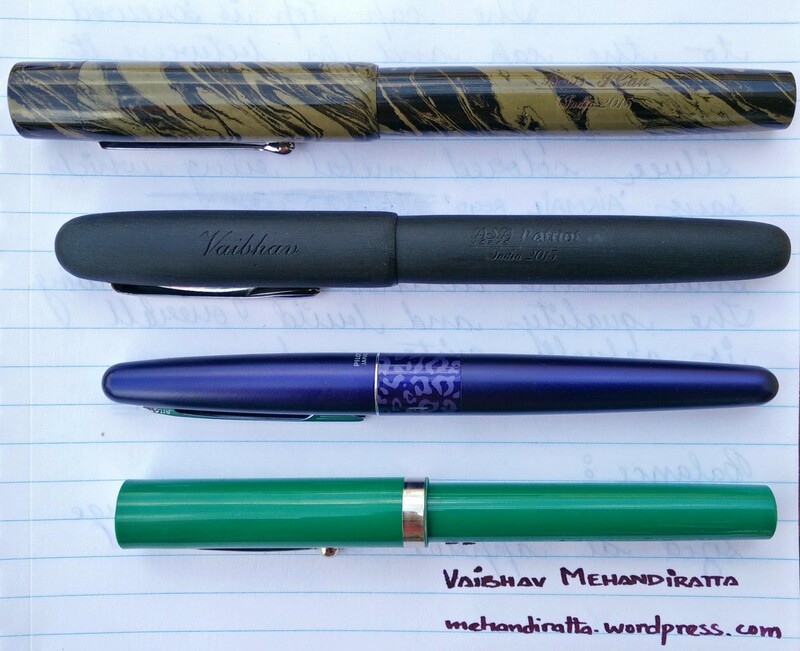 Lately ASA has released lot of pens and believe they will be coming up with lot more in near future. 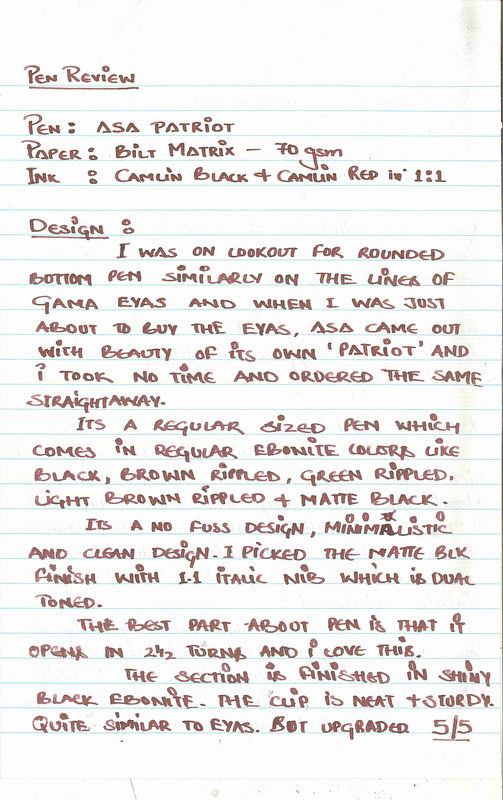 And today I am reviewing another great pen by them which is ASA Patriot. I had my eyes on Gama Eyas / Gama Hawk for a quite a long time because i wanted an ebonite pen with the rounded top and bottoms. I was just about to buy the pen and then ASA came out with this beauty named PATRIOT and i quickly grabbed the same. The pen is a regular sized pen and comes in 5 color options, shiny black, matte black, light brown rippled, dark brown rippled and green rippled finish. Its a regular sized pen which comes with JoWo nib options of F, M , B and 1.1 Italic size. 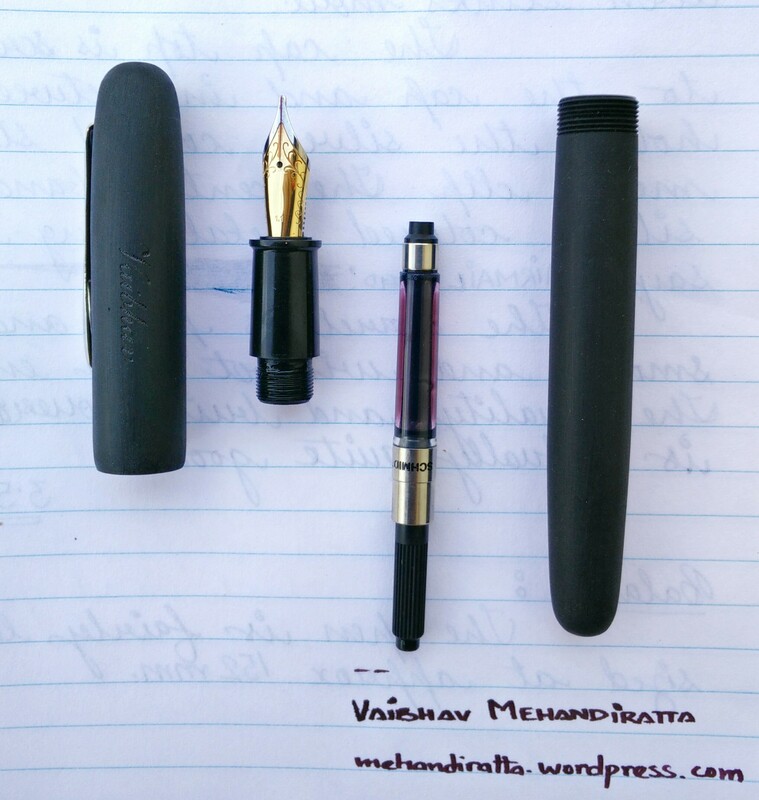 The pen that i reviewed today comes with 1.1 Italic nib. It has a clean and minimalist design. 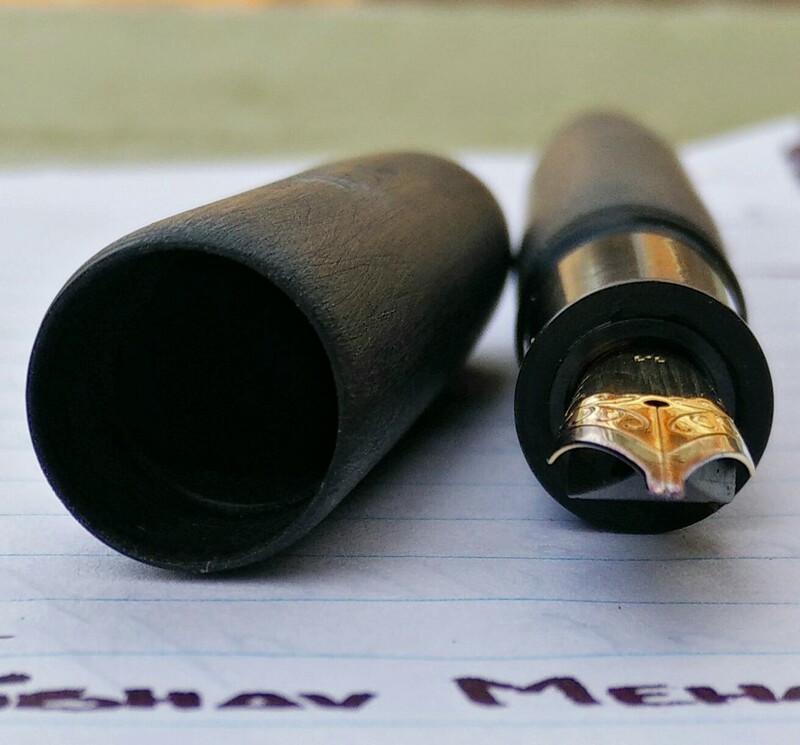 The pen open in 2 and half turns which I beleive is the highlight of the pen being an Indian pen. 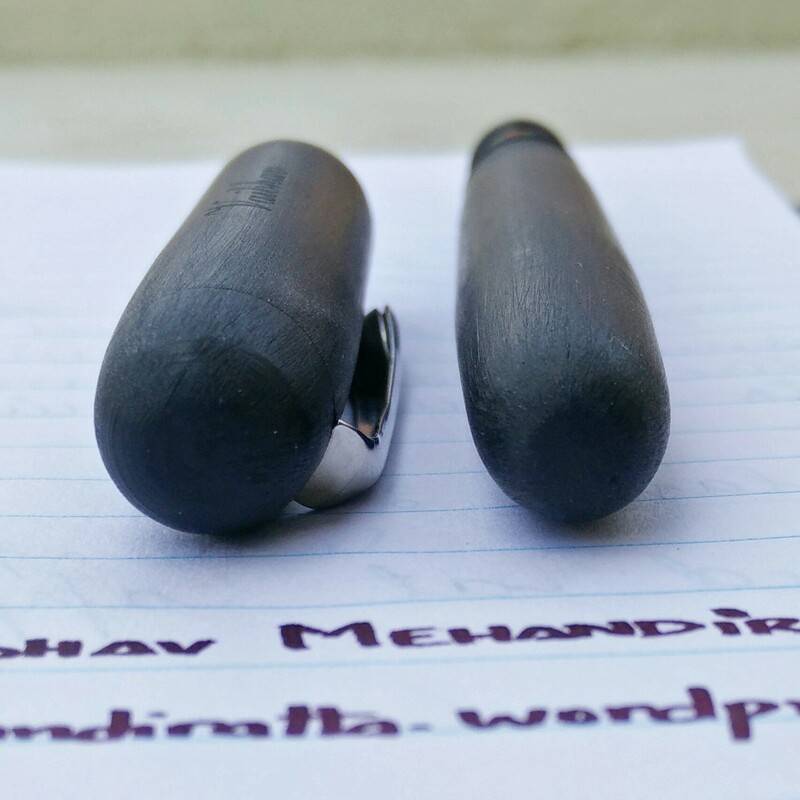 The top and bottom of pen are rounded which are quite nicely done and has been paid lot of attention as it is a handmade pen. 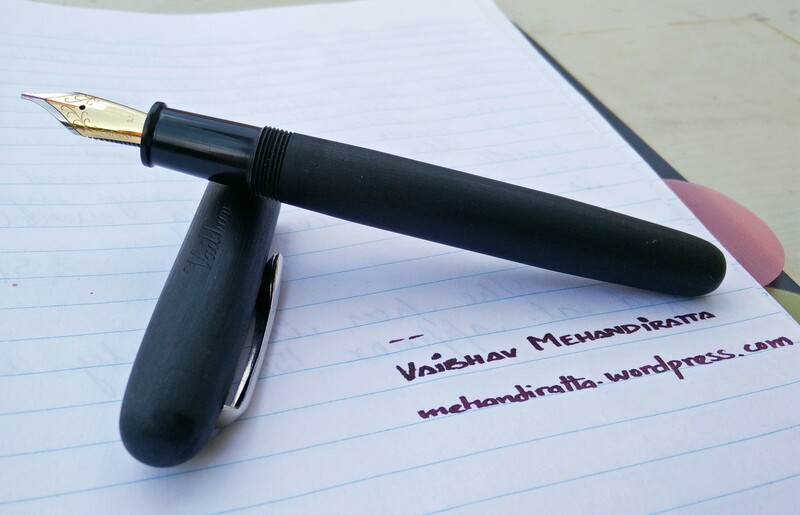 The section of the pen is finished in black shiny finish which is quite okay and provides for sturdy grip. However i would have liked it even more if the section would also have been given a matte finish. 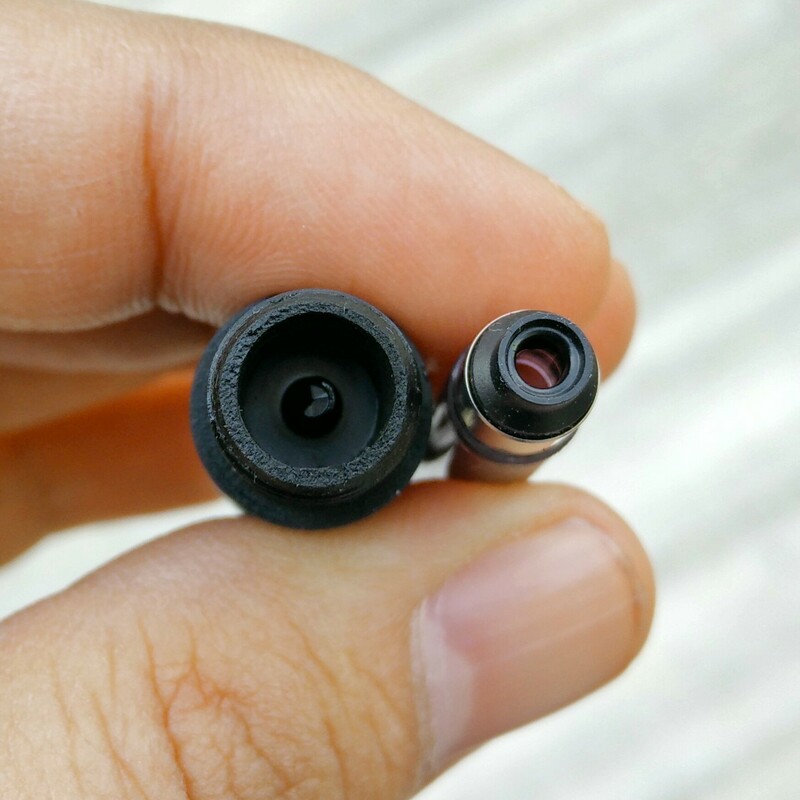 Below is the image which shows the pen broken down in to parts, which shows the Schmidt K5 converter also. The Clip is chrome finished and quite sturdy and the O ring of the clip is well hidden by the rounded cap top. 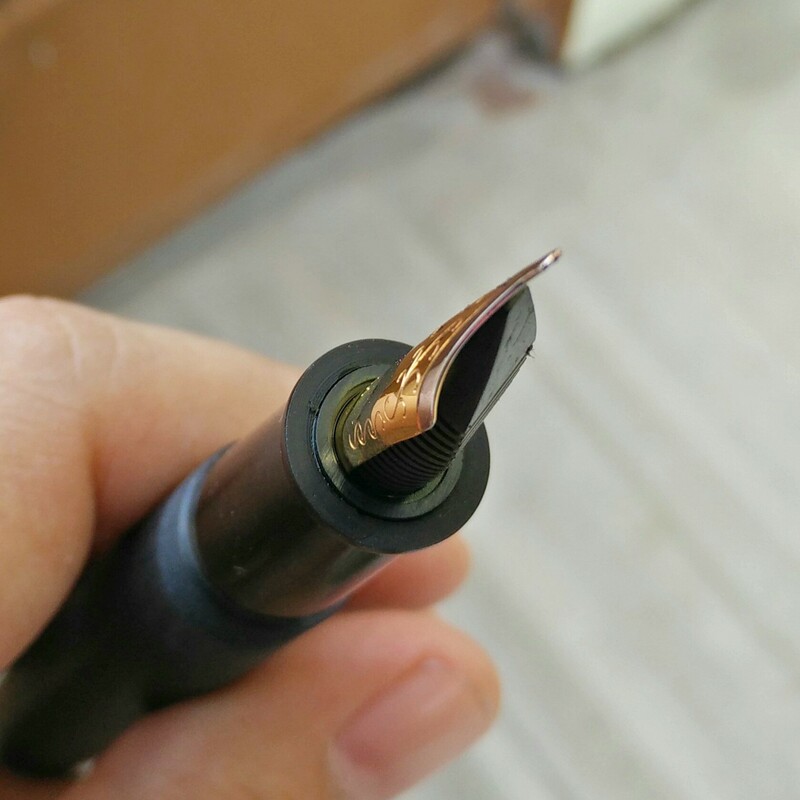 (Update: The clip is push type thus no O ring and that is the reason for uniformity in cap and cap top). Also i got an option to engrave my name on the pen and i opted for the same to be done at the cap which really adds to the beauty of pen. 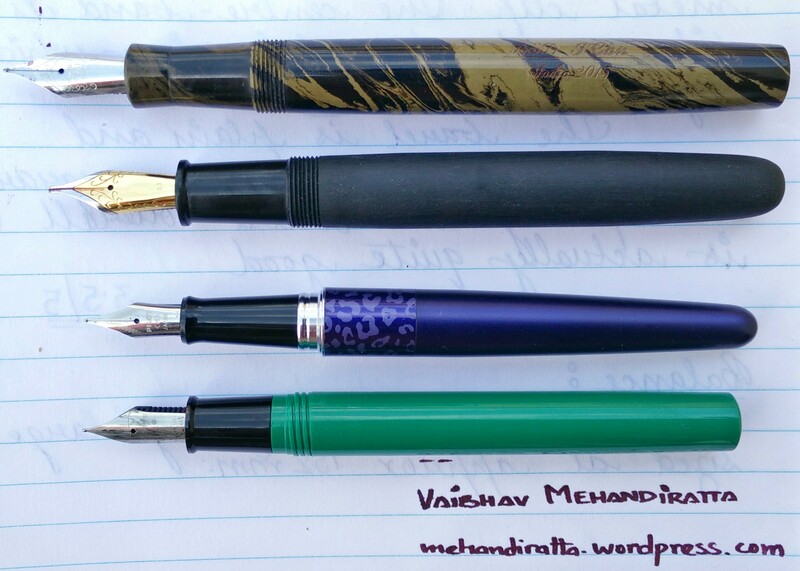 As mentioned earlier the pen is the regular sized pen and below are the few images to show the comparison against various pens. 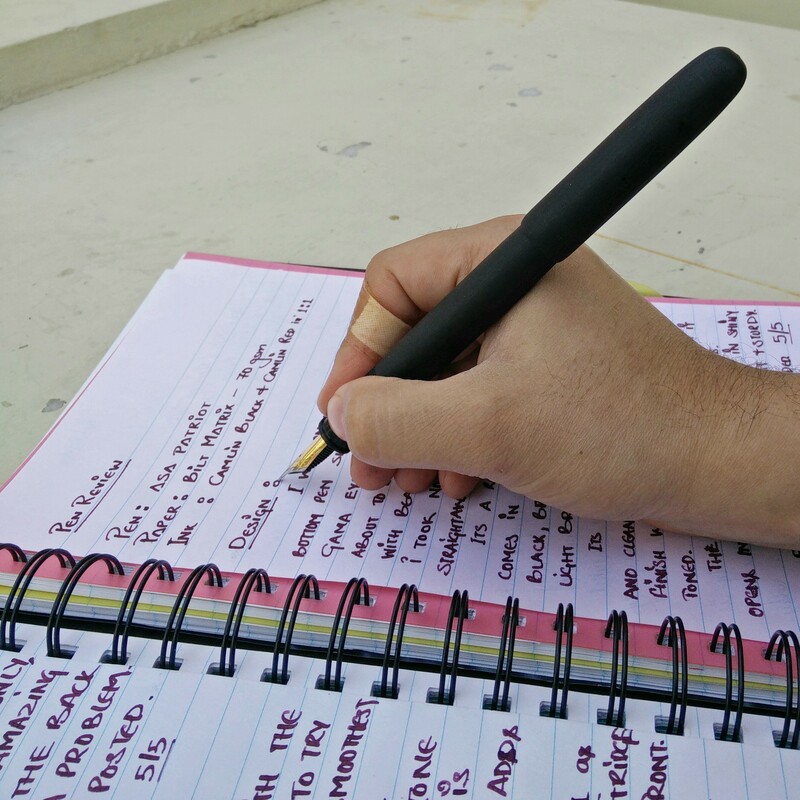 This i a well designed pen which is just a class apart in built quality. Actually its a no fuss design. I loved the pen just because of the look but when I hold the pen it just feels that this pen was made only for me. It fits so perfectly and yes it has and amazing balance. The size is approx 145 mm when uncapped and when capped it is 136 mm including nib. Like most of my pens I love the writing with the pen without cap posted at back. And also the cap easily fits the back and yes it fits perfectly but i was bit reluctant to post it for long because I beleive inner thread of the cap will spoil the matte finish. And yeah cap posting ads certain heft to pen which lot of people might like but not me. Overall love the pen in my hand. AMAZING. 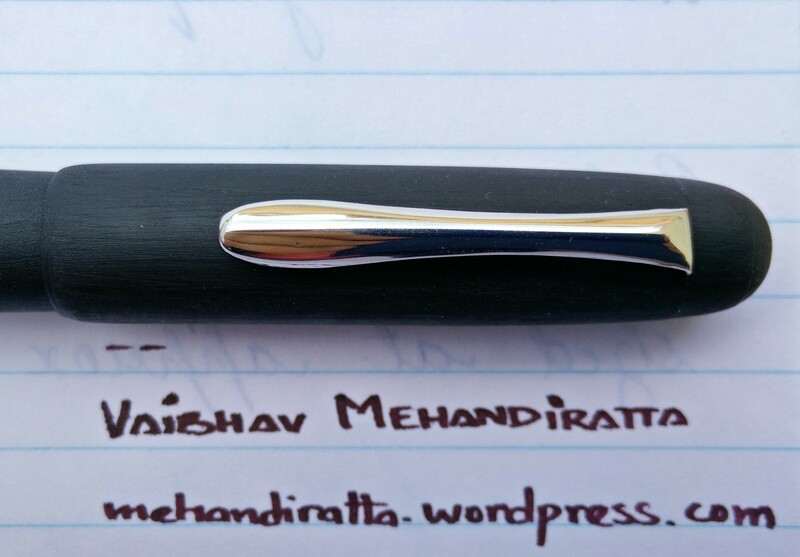 I ordered this pen with 1.1 Italic nib which is a dual tone steel nib from JoWo. It is one of the smoothest italic nib i have come across. Not a hint of scratchiness. Love the way it writes. 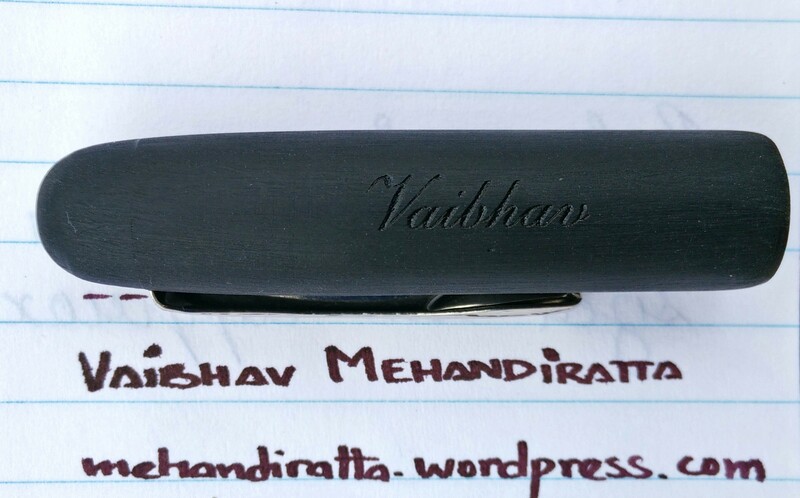 And yeah the nib by itself is beautiful and adds to the aesthetics of pen. The feed is also from JoWo and is made of ebonite plastic. The nib feed mechanism fits perfectly inside the section. Actually it flushes with the sections and becomes a unitized mechanism. Below image explains it a little bit more. The ink filling mechanism is 3 in 1 which means you can use cartridge, converter with this pen and also use this pen as an eye dropper. This come pen with Schmidt K5 converter at additional cost and i decided to go with the same. 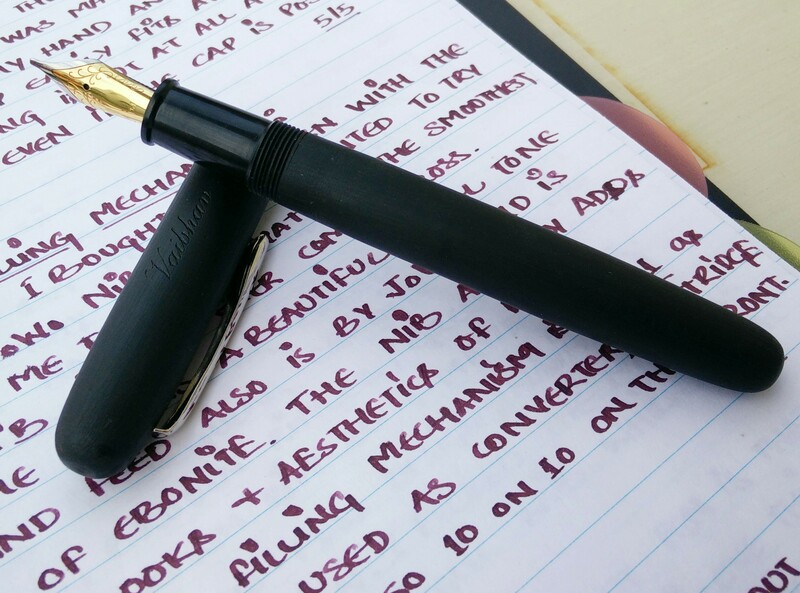 Overall it gets full marks for the nib options and ink filling mechanism. 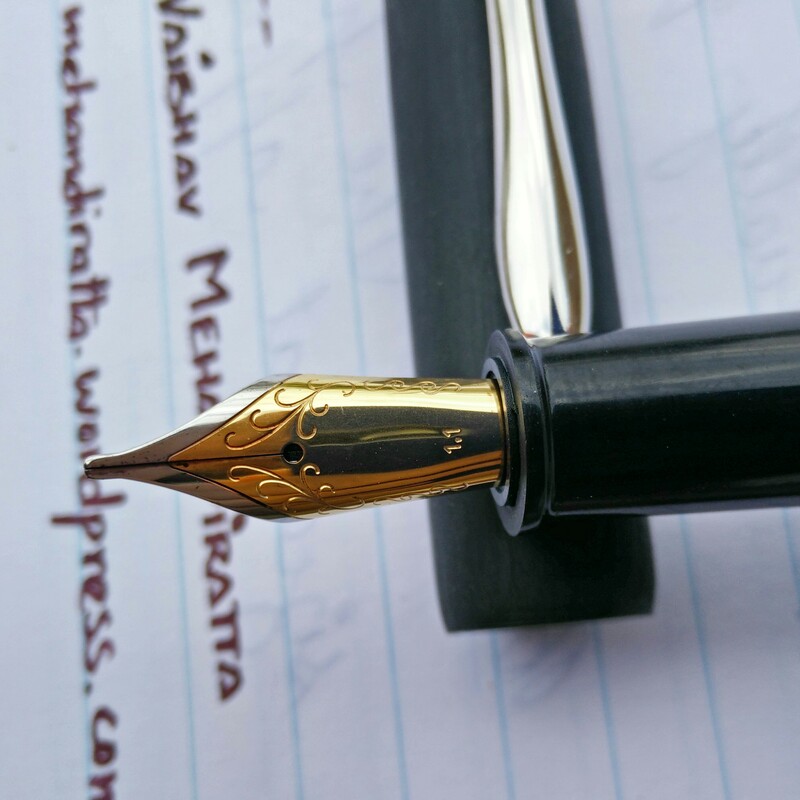 Below one more image shows the closeup of the nib. Looks beautiful. 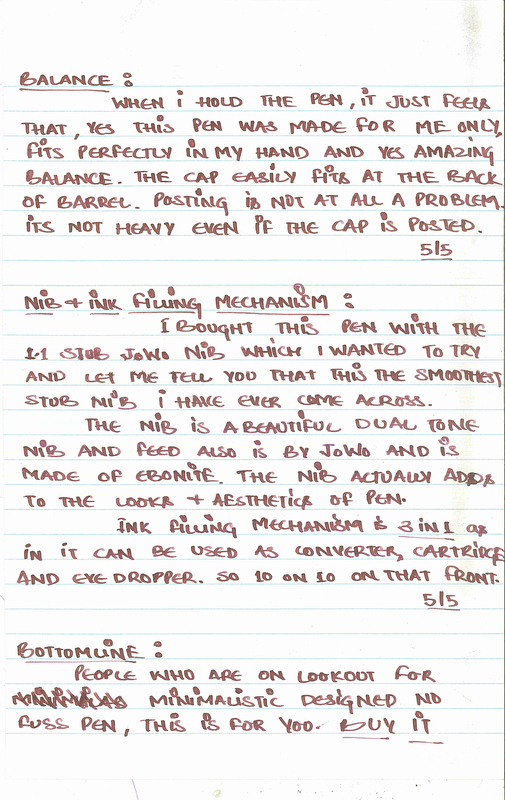 Further down below is my hand written review in detail which also highlights the written sample. 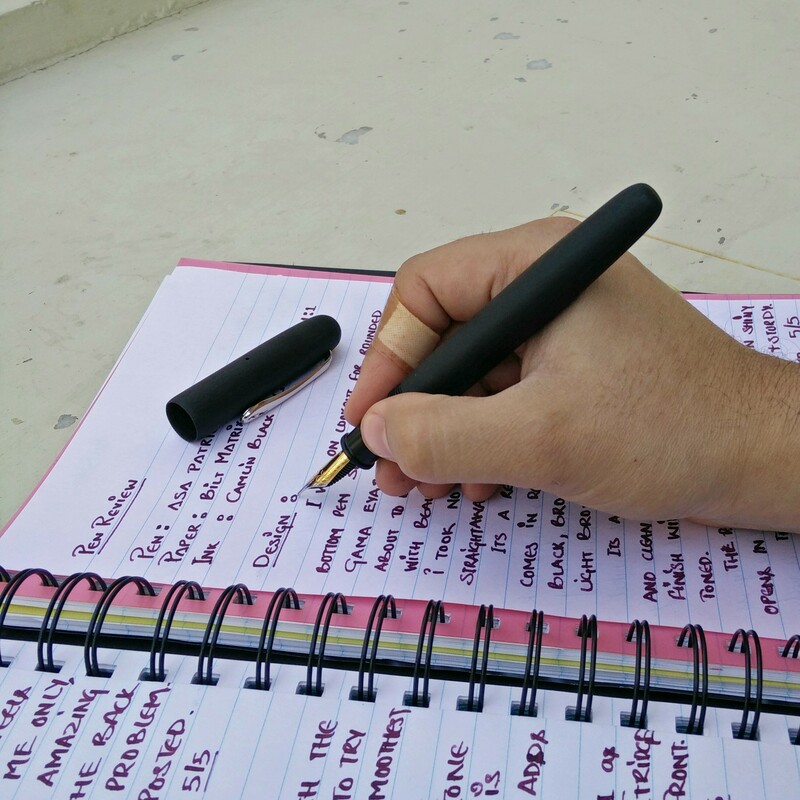 This is one no fuss designed pen which plain yet elegant and oh yeah fits perfectly in to the hand. 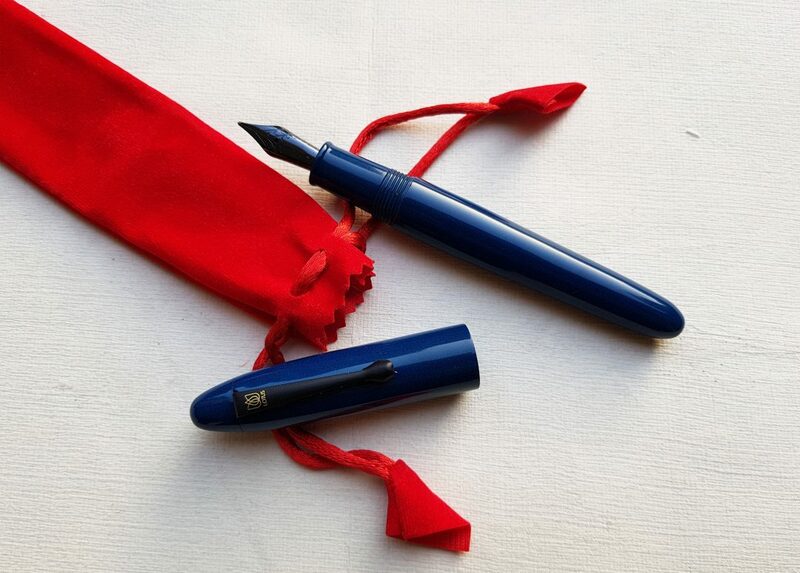 I would definitely recommend to people who are in a lookout for the their first premium fountain pen under Rs. 2000 (INR). I was so excited to receive this pen. But I noticed that the converter (or cartridge) fit very loosely in the section. 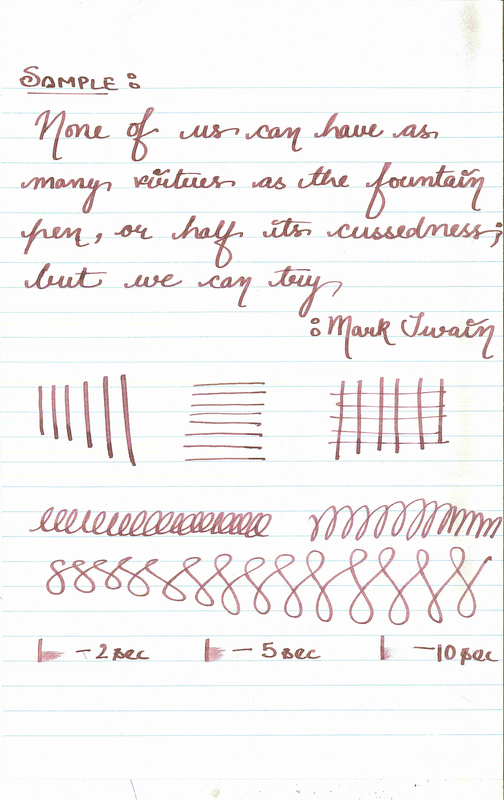 The pen also wrote an excessively wet line. Have you noticed this? I believe this might be a problem… Kindly contact the seller with regards to same… He will sort this out… Which converter your are trying?? Another excellent review. I received my Patriot this week, after it had a two week vacation in Customs for some reason. I look forward to trying it!